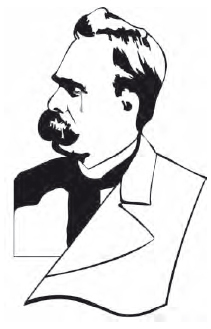 How did Friedrich Nietzsche’s life presage his philosophy? The great irony is that in life Nietzsche was very unlike his heroes, either those of the aristocratic past that he so admired, or of the new age of knowledge and courage that he heralded. His life began in a somewhat sheltered way in Prussia. His father, a Lutheran minister and the son of a Lutheran minister, died when he was four of what the doctors called “softening of the brain.” His mother, Franziska, was only 18 when Friedrich was born; she was the daughter of a Lutheran minister. Contrary to Nietzsche’s belief that his forebears were Polish noblemen, many of them were butchers. At boarding school, Nietzsche suffered from migraines. He was inspired by the poetry of Johann Hölderlin, who had gone insane, so this was not considered a “healthy” subject by Nietzsche’s teachers. Nietzsche studied theology and classical philology at the University of Bonn, but only philology at the University of Leipzig. He served briefly in the army from 1867 to 1868, and was discharged after a chest injury, which was incurred when he landed on the pommel of his saddle while mounting. When he was only 24, his teachers considered him so promising that he was appointed associate professor of classical philology at Basel. Nietzsche moved to Basel, became a Swiss subject, and, in 1869, a full professor. In 1870 he received leave to serve as a medical orderly in the Franco-Prussian War, returning to Basel with both dysentery and diphtheria. He received his doctorate in 1873 and resigned from his academic position in 1879 for health reasons. After that, he continued to write and to travel for nine years. Friedrich Nietzsche was more forward thinking than many of his contemporaries, rejecting many of the values of his time (BigStock Photos).